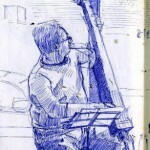 Another Sunday afternoon of music and fun with the quartet from 2-4PM. There are again a few new additions to our songbook repertoire. As always, free admission (but we will be passing the hat around to help support the cause) and the public is always welcome. The cash bar will be open with very reasonably priced drinks. This makes for a great afternoon of a variety of music with a few surprises usually mixed in. 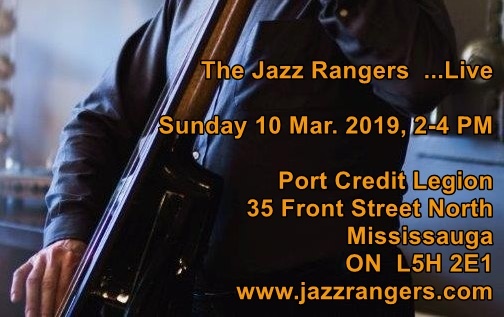 This week we will have the Jazz Rangers… neat on their own… with lots of new material. We will be celebrating New Orleans and the deep south in several traditional tunes mixed in with more of the familiar standards we all love. As always, free admission (but we will be passing the hat around to help support the cause) and the public is always welcome. The bar will be open with very reasonably priced drinks. This makes for a great afternoon of jazz, blues with a few surprises mixed in. We are very pleased to have Gary Martin joining us this week. 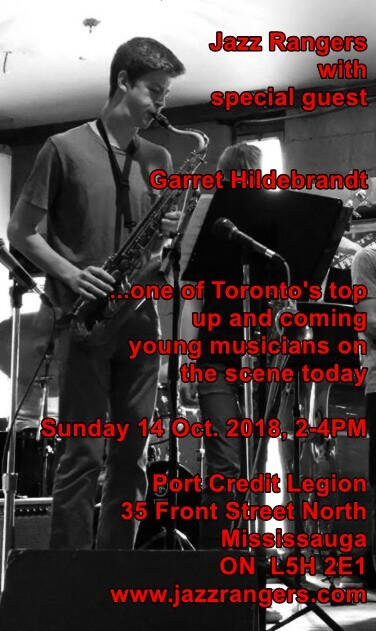 He is well known around Toronto leading his own band “The Megacity Swing Band” and playing regularly with the “Mississauga Big Band Jazz Ensemble” and the “Octocats“. This week will be an informal jam session type of musical gathering where we will be sharing music, some stories and having lots of fun. Remember that the Port Credit Legion is open to the public, there is no cover charge and drinks are very reasonably priced. We are having a holiday season themed show this time around with Christmas and New Year approaching. 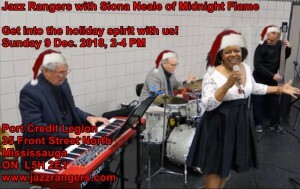 Bring your friends to sing along, dance and just enjoy the fun with Siona Neale’s Midnight Flame and the Jazz Rangers. Remember, all are welcome in the Port Credit Legion which is open to the public. There is the cash bar with very reasonable prices on all drinks. We welcome back Teisha Hall once again. She first sang with us here at the Port Credit Legion in August and we thought this would be a great treat for a special Remembrance Day show. Please take note that we are on later today, starting at 4PM to accommodate for the Legion’s special program on this important day. 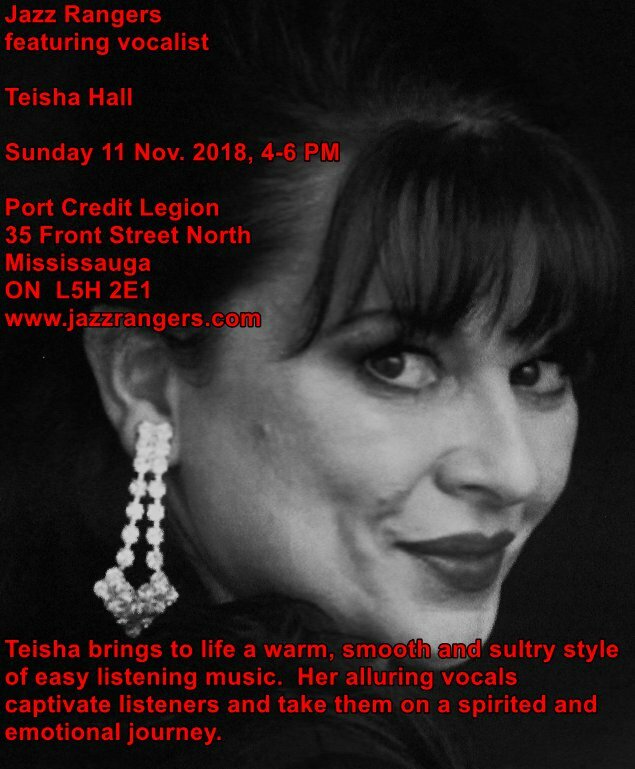 There is lots of space to bring all your friends and family for an enjoyable afternoon of jazz and Teisha’s own stylized pop hits. 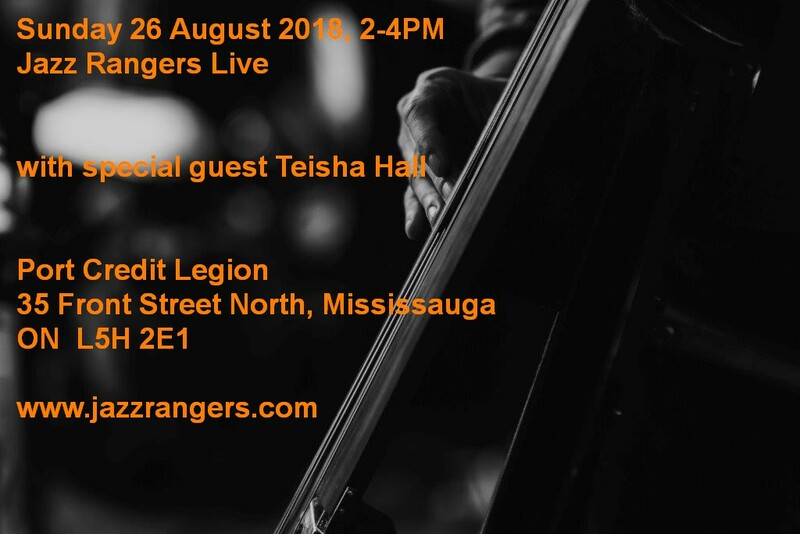 One of the GTA’s finest young saxophone players is joining the Jazz Rangers for the afternoon. Garret, originally from Burlington ON, moved to Toronto this year to enter the University of Toronto’s Jazz Performance program and has already established quite a reputation for himself. He plays with a smooth, relaxed sound, the ultimate goal is having a good time with the other players but most of all, in pleasing the listener. As usual, the Port Credit Legion features a great informal location with a view directly over the Credit River from the club room and very attractively priced cash bar items. Come and listen to Siona Neale with the Jazz Rangers from 2-4PM. 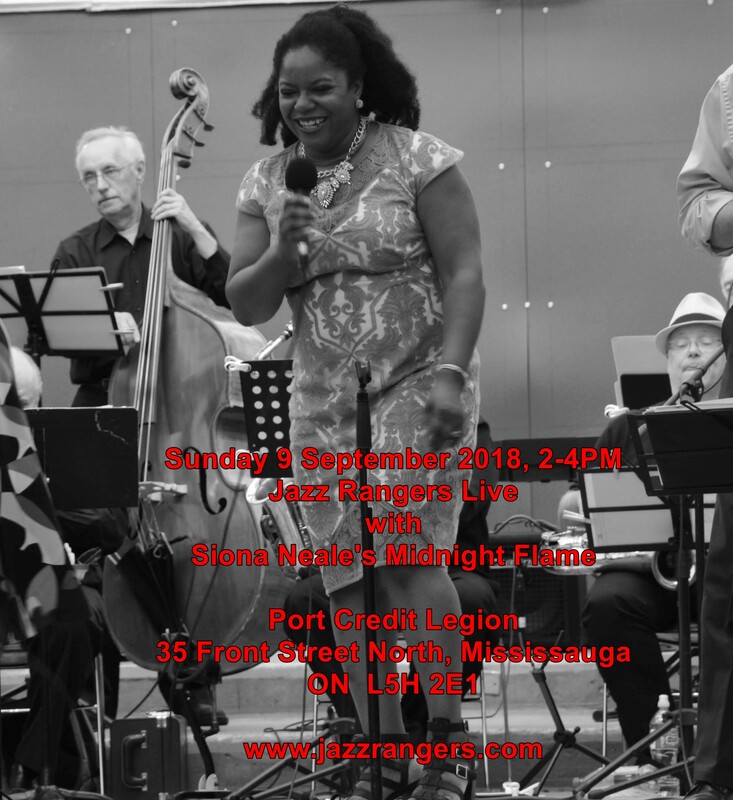 Siona performs regularly as Midnight Flame , sings with the Halton Jazz Singers and the Swingline Little Big Band. We will be playing some fast paced soul, R&B and of course many of your favorite jazz tunes. This week coincides with the final day of the South Side Shuffle’s 20th anniversary taking place just across the Credit River so you can make a full day of great entertainment including this FREE performance. We are thrilled to have the opportunity to play with vocalist Teisha Hall. She has participated in workshops with the famous Sheila Jordan who said “Teisha sings with a lot of heart, and I love that!”. Bring your friends along to hear this wonderful singer. No cover charge, plenty of seating, cash bar with very reasonable prices and BBQ on the deck (weather permitting). We will be passing the hat around for your kind support. 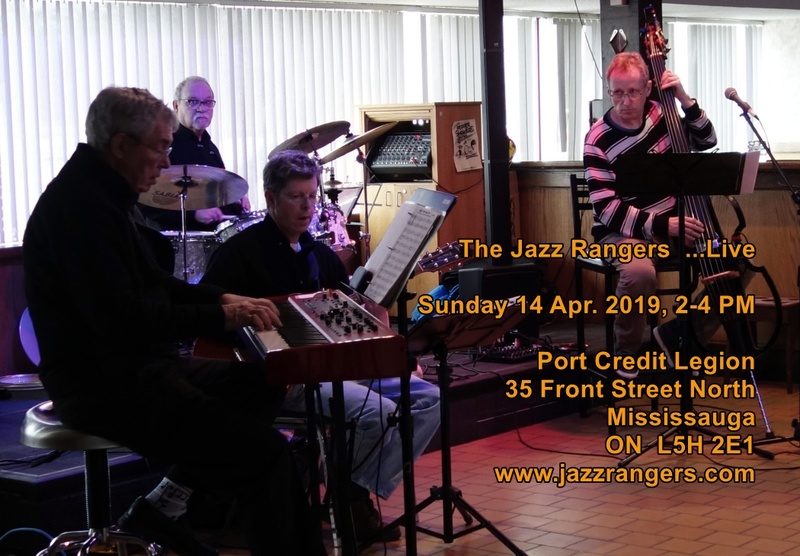 The Jazz Rangers trio with crooner extraordinaire PAUL STEWART will be serving up a collection of pop and jazz favorites from 2-4 PM at the Port Credit Legion. As usual, no cover charge, cash bar and BBQ on the deck (weather permitting). We will be passing the hat around for your kind support. 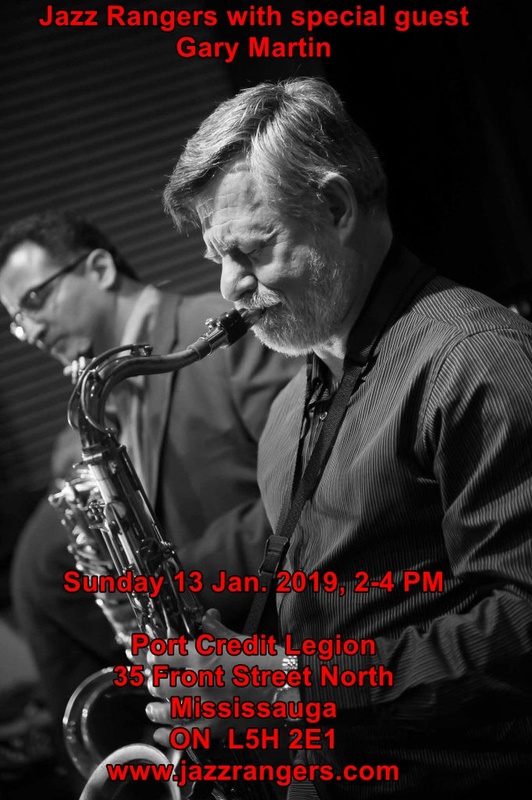 Come see The Spirit of Jazz trio at the Port Credit Legion headed up by Bill Bryant on keyboard. The Jazz Rangers are taking a break this week, but will be back in August.